From the author of Burial Rites, a novel based on true events in early nineteenth century Ireland, about three women drawn together to rescue a disabled child from a superstitious community. Kent brilliantly conjures the sly malice of this folkloric blame culture ... What follows is a kind of Erse reboot of The Exorcist. We turn the pages with increasing horror as the remedies meted out to Micheál become increasingly harsh. 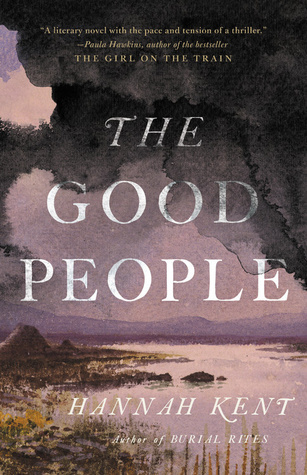 The Good People is a novel about how competing systems of thought – religious, medical, folkloric and, eventually, legal – attempt to make sense of the bad stuff that happens ... Another author might satirise or ridicule such beliefs, lead the characters more obviously to see the error of their ways. Here the reader is left to make up his or her own mind about whether the priest, judge or shaman might offer the most convincing account of the novel’s mysteries. Kent has a terrific feel for the language of her setting. The prose is richly textured with evocative vocabulary – skib, spancel, creepie stool – and despite occasionally straining a little too hard for poetic effect, the overall result is to transport the reader deep into the rural Irish hinterlands. This is a serious and compelling novel about how those in desperate circumstances cling to ritual as a bulwark against their own powerlessness. Kent’s suspenseful storytelling plunges readers into early 19th-century Ireland. She brings vivid life to the hardscrabble scenes: dingy cabins and backbreaking work and the grim hiring fairs where poor children sell their labor to less poor people such as Nóra. When Nóra and Nance head off to confront the fairies, you can feel the mud sliding beneath their bare feet. Although The Good People is fiction, it faithfully represents the hold of ancient Celtic myths on generations of Irish. It also lays bare some hard truths about human nature and leaves you thinking about belief, suspicion and what happens to a community when fear takes hold. Kent showcases botanical language and writes in a prose that’s often delectable. Her novel is more literary than thriller; for long stretches of the novel nothing much happens. There is but one central conflict, between Nóra and Micheál, but the resolution is decisive if unsatisfying. Meanwhile, the novel succeeds in imagining a community of violent ignorance and lassitude. As in Faulkner’s best, Kent presents us with shells of people, consumed with survival. (Two decades later, famine would ravage the Emerald Isle.) The novel’s more historical aspects are more interesting and credible than those supernatural—but when most folks believe in angels, one would not want to presume. What did you think of The Good People?